The aromatic and herbaceous flavors offered by this fresh cheese confirm the Provencale/Mediterranean identity of Californian cuisine. 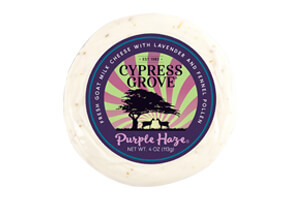 Purple Haze is a goat's milk cheese produced by Cypress Grove Chevre in the stunning and scenic rocky northern California. This artisanal cheese has is silky and creamy and is flavored with wild fennel and lavender pollen; a combination that is reminiscent of French Provence. Purple Haze has a bevy of awards, to name a few; 2nd place at American Cheese Society, 2013, third place at World Championship Cheese Contest 2014. Tastes great crumbled as a dessert with honey or stuffed into pitted Medjool dates with a prosciutto wrap. It pairs well with Pilsner, wines such as Sauvignon Blanc and, Riesling. Ingredients:pasteurized goat milk, salt, fennel pollen, lavender, cultures and enzymes.